The Washington Times published my review of Elaine Shannon's Hunting LeRoux: The Inside Story of the DEA Takedown of a Criminal Genius and His Empire. Critics of Ian Fleming’s James Bond novels often state that the late, great thriller writer’s villains, such as Goldfinger, Dr. No and Ernst Stavro Blofeld, were unrealistically grotesque and evil. But consider real life villains, such as Martin Bormann, Pablo Escobar or Manuel Noriega, a drug trafficking Panamanian dictator who wore red bikini underwear to ward off enemies. (Top that, Mr. Goldfinger). Unlike most crime lords, LeRoux eschewed the flamboyant trappings of illicit wealth and lived in near-seclusion in sparsely furnished condos around the world, hiding behind his secure computer and the dark web. But his enormous ego and greed eventually brought him to the attention of the U.S. Drug Enforcement Administration (DEA). 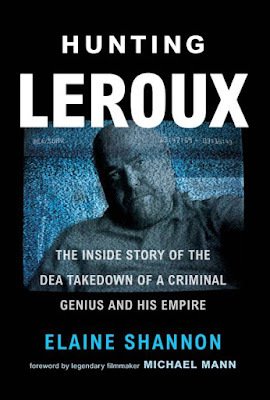 In Elaine Shannon’s true crime book, “Hunting LeRoux; The Inside Story of the DEA Takedown of a Criminal Genius and his Empire,” we learn about the background and criminal enterprises of this oddball crook, and the efforts of the DEA’s secretive 960 Group to bring him to justice. The 960 Group looked for high value targets and they had previously taken down Russian international arms dealer Viktor Bout, another outrageous criminal who seems to have been created by Ian Fleming.